Food Adventures of a Comfort Cook: Plums, Prunes and the Pioneers. Plums, Prunes and the Pioneers. In Utah, there are two major types of plum trees, the first is Potawatomi plums. The trees were planted and grown along natural waterways, canals and ditch banks by Utah Mormon pioneer settlers. Prunus americana, commonly called the American plum, wild plum, or Marshall's large yellow sweet plum, is known by most Utahns as the Potawatomi plum. It can be seen planted in the historic orchard groves of Fruita, Utah, within Capitol Reef National Park. Secondly, and commonly seen in San Juan County yards and gardens is the Purple Pershore. There are three distinct varieties of Pershore Plum (Prunus domestica): the Pershore Yellow Egg, Purple Pershore and Pershore Emblem. The Yellow Egg variety whose seedling was discovered in the ancient Tiddesley wood, Worcestershire, England was developed and named in 1871. The Purple variety is a cross between the Yellow Plum and a similar seedling. It was originally called Martin’s seedling around 1890, but became more widely known as the Purple Pershore. 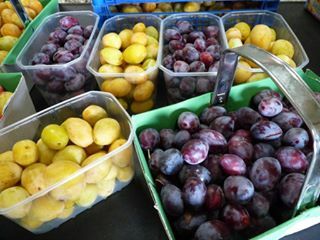 The Pershore plums have many culinary uses such as jams, chutneys, added to cheeses and sausages, used to make puddings as well as the drink Plum Jerkum. Within the pages of Utah State Fare – A Centennial Recipe Collection by Paula Julander and Joanne Milner, there is a recipe for Plymouth Prune Cake (page 125). I found the first step of the preparation rather interesting. “Chop prunes and place in a small saucepan with 1 cup water. Bring to a boil…” basically this is reconstituting the prunes into plums; or re-adding the water back into the fruit. Which got me to thinking about several cans of plums that I had been given. Oh, I am getting very used to folks leaving anonymous bags or boxes of food items at my door with a simple note of, “Here, see what you can do with this.” I chuckle as I consider this a challenge of sorts. Anyway, back to the plums; if the recipe calls for reconstituting the prunes, why not just use plums from the getgo? I made a couple of other changes such as using three 8” x 3.75” loaf pans instead of one 9” x 13” pan, and added an extra ½ cup of flour to adjust for high altitude baking. To gussy up the cake when serving, I put a dollop of whipped cream on the side with a sprinkle of walnuts; it did the trick! The overall texture of the batter is similar to gingerbread, thick and firm, until the plums and juice were added, then it loosened to a pouring consistency. The smell of cinnamon and cloves permeated the home; the taste is similar to spice cake, but slightly milder. This is one of those cakes that makes a cold winter day a bit more comfortable, from the inside out. So remember, love a prune, it’s just a plum that’s been out in the sun a bit too long. In a large mixing bowl, cream butter, sugar and eggs. Mix well. Stir or sift together flour, baking soda, cinnamon and cloves. Add to creamed mixture alternately with milk (1/3 dry plus 1/3 milk). Add chopped prunes and ½ cup reserved prune juice. Pour into a greased and floured 9 x 13-inch baking pan. Bake at 350F degrees for 30 to 35 minutes (my cakes took 50 minutes since the loaf pans were denser in batter).